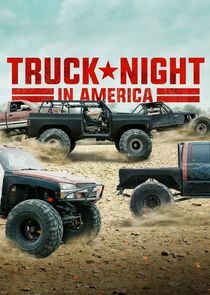 It's truck versus terrain, as 50 truck owners from across the United States compete in grueling challenges that test their ingenuity and driving ability in Truck Night in America. Each episode of this self-contained competition series features five drivers in their personal customized trucks and jeeps going head to head in three challenges, each testing a different vehicle attribute: speed, strength and handling. Between each challenge competitors demonstrate their craftsmanship by re-engineering their trucks for the next round. The last two finalists standing then take on a three-mile, truck killing obstacle course known as "The Green Hell", which challenges trucks and drivers to fly off jumps, climb a mountain of crushed cars, and tear through a snake-infested swamp. Five trucks will enter to compete, but only one can win and take home the prize money and the title of "Truck Night Champion". Helping the competitors are four expert coaches: desert racing champion and truck builder, "Pistol" Pete Sohren; extreme sports pioneer and dirt track racer, Glen Plake; truck builder and master fabricator, Abe Wine and rock crawling champion and master fabricator, Rob "Bender" Park. These four experts offer tough love and their professional perspective on each contender's strategy and performance.